The Lake Room Restaurant is open daily from 6.30pm to 9.30pm. Sunday Lunch is served from 12.00 to 2.00pm. Heights Lounge and Piano Bar is open daily serving food from 12.00pm until 8pm. Afternoon Tea is available daily from 2.00pm to 5.00pm and is by booking only. Combine breakfast with breathtaking views of sunrise over the Lakes of Killarney, take a break from Kerry’s myriad of activities for a delicious relaxed lunch and indulge in elegant afternoon tea with a glass of champagne. As night falls, enjoy an apéritif with friends and savour Kerry’s freshest ingredients and artisan produce in The Lake Room restaurant. Sample the finest in contemporary dining in the award winning Lake Room Restaurant. 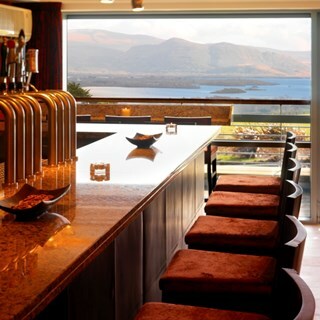 With breathtaking views overlooking the world famous Lakes of Killarney, a cosmopolitan atmosphere and a superior wine list the Lake Room is a perennial favourite with guests and locals. Soak in a stunning sunset over Killarney National Park, savour the freshest in-season local artisan produce and marvel at the latest innovative dishes created by our team of talented chefs. From aperitif to the last petit fours, fine dining at the Lake Room is the perfect venue for romantic dinners, family gatherings or a get together with friends. The Restaurant also boasts a small semi-private section ideal for family celebrations, anniversaries, birthdays, christenings, communions and confirmations. The Heights Bar and Lounge. The ultimate all day casual dining option, combining five star elegance with a comfortable, relaxed atmosphere. Sink into the deep sofas, snuggle up in the ample armchairs and simply let time stand still as you take in the breath taking views of the Lakes of Killarney. Indulge in delicious light bites from our lounge favourites, order a drink from the bar, choose from our extensive wine list or sample something adventurous from the cocktail menu. The Heights Lounge is the perfect spot to catch up with friends, family or business associates. Afternoon Tea in The Heights Lounge is an occasion of unparalleled elegance. Traditional Afternoon Tea is the ultimate treat and a wonderful way to catch up with friends or celebrate a special occasion. The service was great and I think it would be a great touch if guests were welcomed to dine by name once having given their room number. Additionally if housekeeping and dining liaised rooms could be serviced while guests had breakfast rather than at 3 pm. Aside from these small elements we had a wonderful stay. Food and service was good. Our children are nine and seven - their food, although good, is expensive for what you get. Possibly a strategy aimed as a deterrent to families with young children! The 'adult' dishes were excellent, both in quality and value. Tad bit expensive but gorgeous food and lovely staff! The service in the lounge was not as it usually is ....very slow in the afternoon. Delicious meal with wonderful staff catering to our every need. Lovely greeting on arrival by reception and concierge. Ckeck in was easy and shown to our room with full information on location of all amenities.Room was very well presented. Had dinner in the Lake Room Restaurant,  staff were very pleasant and approachable and able to answer any questions in relation to menu selection etc. Great variety of options for breakfast, staff very friendly but service was slow. Would recommend for a relaxing break. Great walks in the area also. We had a fabulous stay at your wonderful hotel. It was our third stay and this time for my father’s 70th birthday. On check in, the receptionist asked if there was a special occasion and shortly after arrival to the room, Dad got a lovely welcome dessert. We had a wonderful meal in the lounge and as always, all staff are so friendly and helpful in your lovely, relaxed hotel. Looking forward to coming back soon. Staff were wonderful. Could not do enough to make stay memorable. No problem recommending this hotel to anyone. This is the 2nd time we have been to the hotel, staying as guests and also for dinner. While both times service has been exceptional each time the food has arrived lukewarm to the table. For breakfast I returned the item to the kitchen this time I was disappointed to find that both my dinner and my husband dinner was lukewarm. The potatoes were nearly cold which definitely reduces the dining experience. Overall everything was excellent from excellent and friendly waiting staff to excellent food. I also got a late coffee with my desert with no extra charge which was a lovely touch. Its the small things like this that you remember. Will recommend and will be back. Nice food but a bit overpriced. Our waiter was great ! Very quiet when we were there so lacking atmosphere slightly but the food was fantastic. We both had a really relaxing afternoon at Aghadoe Heights on Saturday. The Afternoon Tea was definitely one of my favourites and I would have no problem recommending it.